Sony have announced the newest member of the Playstation family – the Playstation Classic. 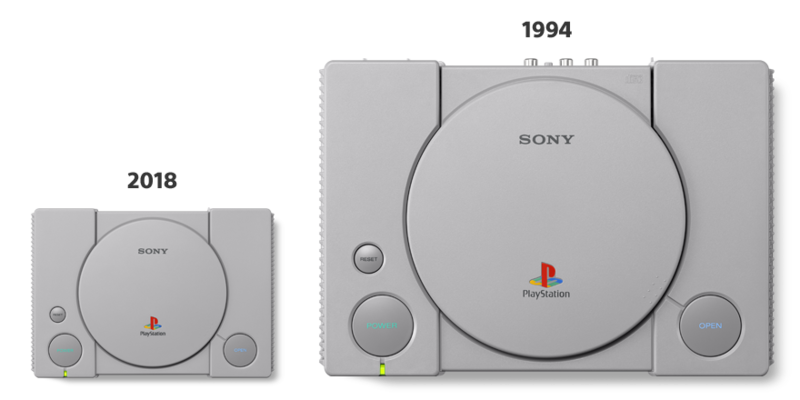 Billed as a “miniature recreation mirroring the look of that original console,” the Playstation Classic resembles the original Playstation. Sony claim that the new machine is 45% smaller than the original. This fun-sized console would be perfect throw into a bag and take to a friend’s house. The Classic also replicates the play experience of the original console with the inclusion of two original controllers. However, in a nod to modern gaming, the memory card is now all-digital. The console is set to launch with 20 classic titles. Those announced so far include Final Fantasy VII, TEKKEN 3 and Ridge Racer Type 4. Clearly, there are many hours of fun to be had with those titles, let alone the games that Sony are yet to announce. The Playstation Classic is available on the 3rd of December for £89.99 (RRP). If this is as popular as the NES/SNES mini consoles that Nintendo put out recently, they may not last long. Nintendo’s mini consoles sold out almost immediately in many places. It remains to be seen if Sony are better at supplying demand. Just like Nintendo, it seems Sony are missing a trick by not incorporating a digital storefront. Imagine allowing the rest of the PS1’s catalogue to be purchased, downloaded and played. They could even have allowed the console to read original PS1 discs, which so many people still have, but it’s clearly too small for the disc to actually fit inside. Sony’s offering, then, seems very similar to the mini Nintendo consoles. The price certainly isn’t unreasonable, but it does appear to be lacking a few features that would make it an absolute must-have for me. What do you think? Which games are you hoping will come pre-loaded?